WEEKEND PLANNING | Beverly's Net: family. food. fashion. WEEKEND PLANNING – Beverly's Net: family. food. fashion. Hehe B rocks.. I wish they were available in a store near me! I so so so agree with you on the Balenciaga bag!!! Initially I didn’t care for it, and only bought it because I’ve already ordered and it came to me without informing me. But when I saw and as you said, felt the bag, wow, I love it to death!!! The leather’s so soft and thin and SOFT. And the colour’s so beautiful! It’s just so different from other leathered bags. Makes me want to go out and grab more Balenciaga bags. Yes exactly! It does look PRETTY in the photos, no doubt.. but I still wondered what the real special-factor was.. what set it apart from LV and other bags like that. Damnnnn girl… that Balenciaga is haaawwwwwwwtttttttttttt!!!!!!!! no you’re not crazy. If I have that bag I would’ve done the same too. Love the color. I’m a blue bag lover LOL!!! But I can’t see the photos of the cakes?? OMG how can they be real cakes. o.O Seems so realistic too. I swear the first few pics of the cake made me think they were real stuff and not cake! YUMMY! Yeah I thought they were plastic ornaments of bags or something! So jealous that you have a Balenciaga bag, there’s like no people in Edmonton that carry them on a regular basis. Its a refreshing change from LV. I also love those cakes, my fave ones are Burberry and Gucci and the LV cake is amusing too. I want to get 1 of those cakes for my bday! But th\at requires a party.. ehhhh. Love that bag! And that colour is gorgeous too. And those cakes are so well done! I bet you’d like one for your birthday too! Oooh, those cakes are divine! 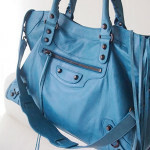 The Balenciaga looks very cute, love the sky blue color… although I actually prefer the “inspired” bags to the real ones, just ’cause I hate carrying the exact same bag as someone else. Hehe true.. I wonder how they taste? ?